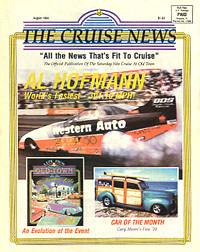 We began publishing The Cruise News back in August, 1994. Since then we have grown immensely, and refined how we bring the latest Florida auto enthusiast news to our readers....adding pages, a glossy cover, and a wealth of experience over the years. We are the official publication of the world famous Saturday Nite Cruise at Old Town, and have a booth set up there on "trophy row" every Saturday night, but that is only a small part of what the magazine is about. Traveling quite a bit, and with help from contributors around the state, we are able to cover all Florida has to offer in the automotive relm....which is quite a lot! To find out more about the people behind the magazine, click on their picture to see their profile. More profiles to be added as they become available.